Arrive in Perth to start your holiday and be transferred to your Fremantle hotel. Meet and Greet Personalised Arrival Transfer, Overnight Fremantle Accommodation. Fremantle's historic colonial streets pulsate with the energy of street-performers and buskers, couples walk hand-in-hand through its colourful and lively markets. The lively street cafes and restaurants along its famous 'cappuccino strip' are perfect resting places to indulge in a spot of people watching. Spend the day exploring this bohemian port town at your own leisure. Depart Fremantle this morning and travel north along the coastline to Yanchep National park to for an Aboriginal cultural experience. Continue along the coastline to Nambung National Park, home of the eerie Pinnacles, a spectacular series of limestone formations, millions of years old, spread amongst the desert. Later, visit the HMAS Sydney Memorial and enjoy some free time to explore the seaside township of Geraldton before retiring to your hotel for the night. Luxury Coach Tour, Yanchep National Park, Pinnacles Desert, HMAS Sydney Memorial, Overnight Geraldton Accommodation. After breakfast, leave Geraldton and visit Shell Beach, one of only 2 beaches in the world formed completely by billions of coquina bivalve shells. Later, continue to Denham and visit the Shark Bay World Heritage Discovery & Visitor Centre and learn about the rare scientific and historical objects housed there before continuing to the crystal clear waters and beautiful beaches of Monkey Mia. Breakfast, Shell Beach, Denham, Shark Bay World Heritage Discovery & Visitor Centre, Overnight Monkey Mia Accommodation. After a relaxed breakfast overlooking the bay, watch as the famous dolphins of Monkey Mia swim to the shore to be fed. Spend the rest of the day at your own leisure making use of the resorts facilities or you may choose to take part in a range of optional activities such as scenic flights over Shark Bay or a cruise along the Bay looking for the abundant marine life of the area. The choice is yours. Breakfast, Overnight Monkey Mia Accommodation. Enjoy a hearty breakfast this morning before travelling to Hamelin Pool to see the unique colony of Stromatolites, described as the earliest record of life in the world. Later, continue into the spectacular Kalbarri National Park and take in breathtaking views and scenery of the Murchison River Gorge. Breakfast, Tour of Stromatolites, Dinner, Overnight Kalbarri Accommodation. Leave Kalbarri today for your journey back to Perth. This evening, enjoy a special farewell dinner with your fellow travelers and recount stories of your wonderful journey. Breakfast, Dinner, Overnight Perth Accommodation. Today marks the end of your Western Australia adventure. Say goodbye to your fellow travelers after breakfast this morning and get transferred to the airport for your flight home. The best time to visit Western Australia is undoubtedly during wildflower season, where the landscape erupts into magnificent colour. Travel to WA during September, October or November with this package to experience this remarkable natural phenomenon. There are more than 15,000 species of wildflowers throughout WA - many only found here - such as clusters of splendid rare orchids in the south, prolific inland carpets of everlastings as far as the eye can see to colourful roadside kangaroo paws. Your special overnight Luxury Coach Touring includes 9 meals. The luxury vehicle has a personalised air-conditioning, a video system and on-board toilet. You will be personally met by a DISCOVER AUSTRALIA representative and transferred from the airport to your Fremantle hotel. 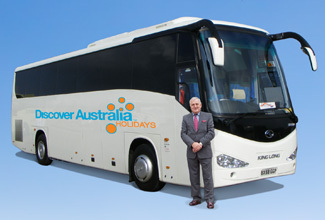 You will also be transferred from your Perth hotel to Perth airport to meet your flight home. 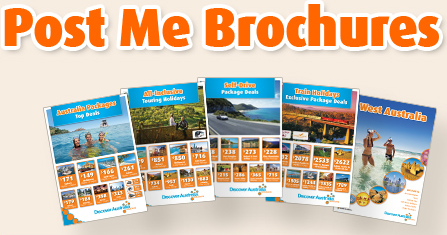 The Perth, Monkey Mia, Kalbarri & Pinnacles Premium Coach Touring is very popular. Many dates book out well in advance, please book soon.